Vitalik Buterin has been one of the most vocal names in the cryptocurrency community. A young genius, Buterin is the co-creator of Ethereum - and has been a strong believer in the power of cryptocurrencies. However, in a now-deleted Tweet, Vitalik Buterin teased sarcastically that he might leave Ethereum to join Google. Let us take a closer look at this recent development. Earlier today, Vitalik shared a screenshot of a recruitment mail he had received from Google. It appears that Buterin has been in touch with Google and might even be considering joining it. While this thought seems far fetched considering the amount of time that Buterin has invested in the development of Ethereum - this might not be a shocker considering how upset Buterin has been with the cryptocurrency community of late. Interestingly, Google has been one of the rare few names which is yet to jump on to the blockchain bandwagon, at least publicly. Others such as Amazon, Microsoft and Facebook have all been exploring possibilities to innovate their platforms with the help of blockchain technology - with Facebook even planning to launch a native cryptocurrency token. This is quite an interesting turn of events for Google - possibly even hinting Google’s interest in Ethereum development. If Ethereum does get Google’s backing - it will indeed help the platform a lot. Google is a tech giant which has revolutionized the way we know internet to be. Google’s Android OS, as well as their dominance on the web, is unparalleled and if the two were to team up, it would result in a win-win partnership for both the parties involved. Many in the Ethereum community believe that Ethereum is a far superior product than Bitcoins - even expecting that ETH prices and market cap would one day take over the BTC market cap and price, in an event that Ethereum enthusiasts have been calling ‘The Flippening’. While it is highly unlikely that the flippening takes place any time soon - it is quite possible that Google backing it would help this cause. While Google is yet to announce any official blockchain or cryptocurrency related unit - a number of ex-Googlers have come together to form the ‘xGoogler Blockchain Alliance’. 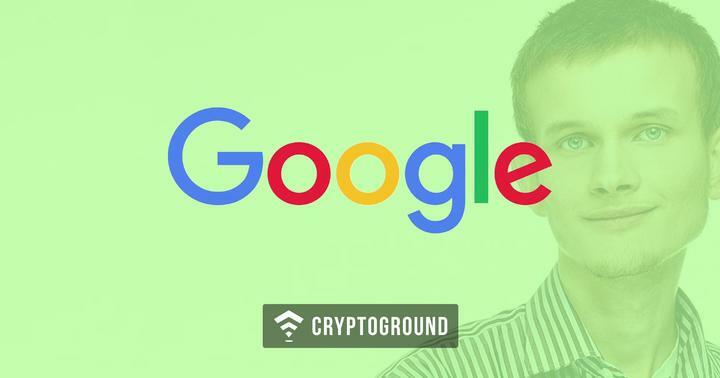 Google insiders have claimed that the company is considering a major blockchain push in the days to follow - but details are still unclear as to what the exact plans are. Buterin has often expressed displeasure over the direction that the cryptocurrency community has been heading. Vitalik Buterin believes that the blockchain systems are the primary technology and cryptocurrencies are just a byproduct. However - the crypto community at large has been focusing way more on cryptocurrency prices than on blockchain development, which has reduced this innovative and pathbreaking concept to merely a tool of investments.